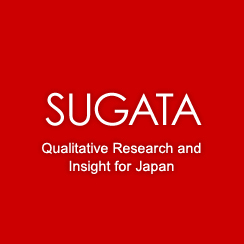 Sugata Research brings a more personal approach to qualitative research in Japan. Our mission is to deliver big thinking with a small scale feel. We work with some of the biggest companies in the world, helping them to understand the lives of Japanese people and turn that into insightful direction for their brands. Our seasoned team of bilingual researchers combines an intimate understanding of Japanese culture with a globally informed perspective on marketing. We've spent our whole careers getting close to Japanese consumers and understanding how brands can thrive in this often misunderstood culture. We custom design each research program, drawing from a wide suite of techniques and aiming to understand issues from multiple perspectives. Ethnographies – or online 'Moblographies' using our own in-house research system – allow us to observe consumers in their natural habitats. In the facility, we use Co-Creation Sessions and well-thought-through Discussions Groups to charge our collective thinking. We use whatever works best from our toolbox of techniques to deepen our understanding and inspire actionable results. Sugata is a Japanese word meaning form and a Sanskrit word meaning ideal realisation. We chose the name to represent our collective vision for the company: to help brands and businesses realise their ideal form in Japan's unique cultural setting. ©2013 All rights reserved by Sugata Research Co., Ltd.